Forum Index > Historical Arms Talk > Help with three 8th-11th century scabbards. Posted: Sun 01 Apr, 2018 8:29 am Post subject: Help with three 8th-11th century scabbards. I'm looking for high-res pictures of the Cronk Moar and Ballateare swords. I've looked on the net but I can't find any really good high resolution close ups of the hilt and scabbard fittings of these swords that are good enough to conclusively tell how they were put together. Is anybody who has been to the Manx museum willing to share some high-res photos? 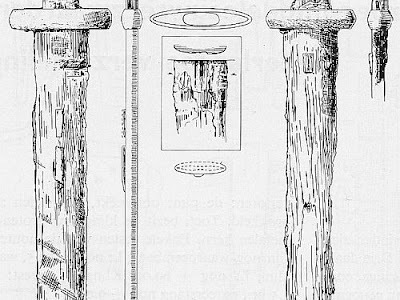 Also, I came across this drawing of a couple of swords found at a place called Steins in the Netherlands which is interesting because it appears to have a strap slide/bridge carved into one half of the scabbard core. This would find could explain at lest some of the strap slide/bridge impressions seen on some of the scabbard leathers found at York and Gloucester in the UK as well as a bunch of manuscript illustrations. Does anybody know which museum this thing is preserved?